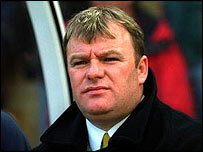 Former Boston manager Steve Evans has lost his appeal against a 20-month FA ban and £8,000 fine after allegations of contract irregularities at the club. In February, the FA banned Evans from football and fined him it decided Evans had impeded and misled its inquiry into financial irregularities at Boston. The ruling came at the end of an eight-month investigation into events at the club, which began shortly after they won promotion to the Football League in 2002. In July, Boston were fined £100,000 and deducted four points for contract irregularities. An FA statement relating to Evans read: "As to the appeals against conviction, these were dismissed in their entirety. "As to the appeal against penalties, the decisions were as follows: the total period of suspension imposed, which was 20 months, was not reduced at all. "But the date from which it was to commence was put back from 3 March 2003 to 4 July 2002, the date upon which Mr Evans was suspended by Boston United Football Club; the appeal against the fines imposed was dismissed. "Additionally, Mr Evans was ordered to pay a proportion of the appeal board's costs." After serving the suspension, Evans will be able to return to football management next year.